Is your Small Business looking to Outsource IT needs in the Oklahoma City metro? Here are some of the benefits to a MSP. Small businesses usually have a couple of options for IT support. Either they have someone in-house who also oversees many other job responsibilities outside of IT needs OR an IT professional they call when IT problems arise. 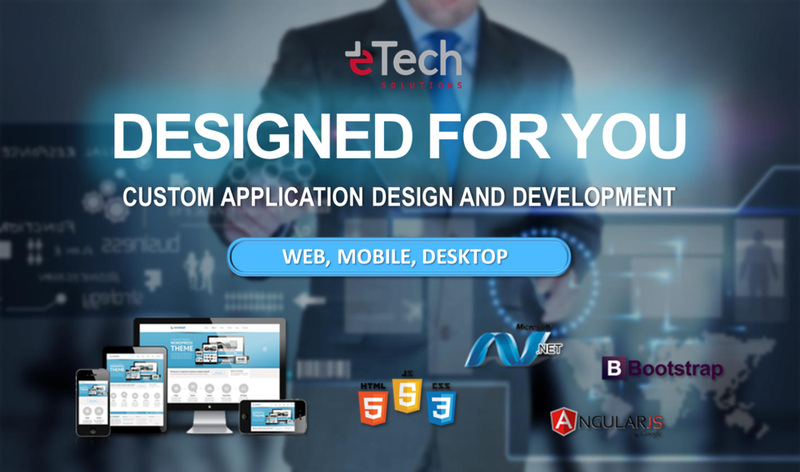 Both options can cause a lack of support when the designated IT person is either busy doing other things or unavailable to come to your site right away. Outsourcing your IT needs to a Managed Services Provider (MSP) like e Tech gives you and your employees access to constant help desk support and system engineers who handle complicated network and hardware issues remotely or onsite. Many companies operate on the break-fix philosophy where they address IT problems as they arise. However, only addressing problems when they arise could be creating bigger problems later on...especially if the IT personnel is only patching an issue instead of solving the root problem. MSP's solve IT problems before they even start! That's right. With constant monitoring and maintenance that a MSP performs, less IT problems arise and when they do they are caught earlier and resolved quicker. At this point, if you are the "IT Guy" at your company and yet your main job is something completely unrelated...then you are probably ready to call us right now. You may know some IT but not all and now you are searching for a company who can fill the gaps. That's where a MSP comes in. We can handle some or all of your IT needs. Our support technicians and systems engineers can become your IT team so you no longer feel your company's IT problems are on YOUR shoulders alone. Managed Services basically means we become your IT department. We can oversee all or part of your organization’s technology including maintenance and monitoring. We take care of the hassles and headaches of IT, so you can take care of your customers and grow your business. If you are looking for someone to manage your IT network, e Tech Solutions can take care of all or part of it. Call us at 866-608-4044 toll free. Schedule and complete a $500 Network Evaluation by August 31, 2017 for a chance to win a Microsoft Surface Pro. Are your employees complaining about computer and server updates running during the day when they are working? Let us manage your IT system updates and maintenance! Not only will your systems be running at top speed and better security but your employees will thank you for not interrupting their work. If your company is not running regular maintenance and updates on your computers, servers, and other IT systems then you could be creating security risks. Allow e Tech to assess your IT network with our network evaluation. We can show you just what needs to be done to ensure your IT network is working properly and securely. Many small and medium businesses in Oklahoma City are searching for IT solutions for their IT headaches. We are considered one of the best managed services provider in OKC with our experience and commitment to service. Search no farther than our Managed Services program to give peace of mind that your IT systems are taken care of. Here are some reasons to go with a managed services provider. Studies show Managed Services costs less than hiring a full-time IT employee. Businesses can also effectively budget their IT needs. With Managed Services, businesses are provided with the resource of a complete IT department with diverse IT knowledge. Managed Services means IT systems are more reliable due to constant monitoring and regular maintenance. 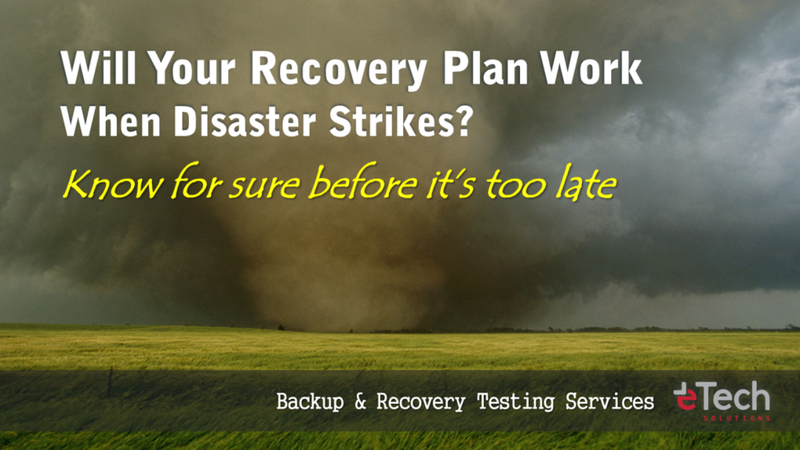 Breaks and failures occur less frequently with Managed Services and are caught quickly and resolved promptly. Small and medium sized businesses in Oklahoma City are faced with the reality that maintaining an operational IT environment is a necessity but is also costly, time-consuming, and complicated. 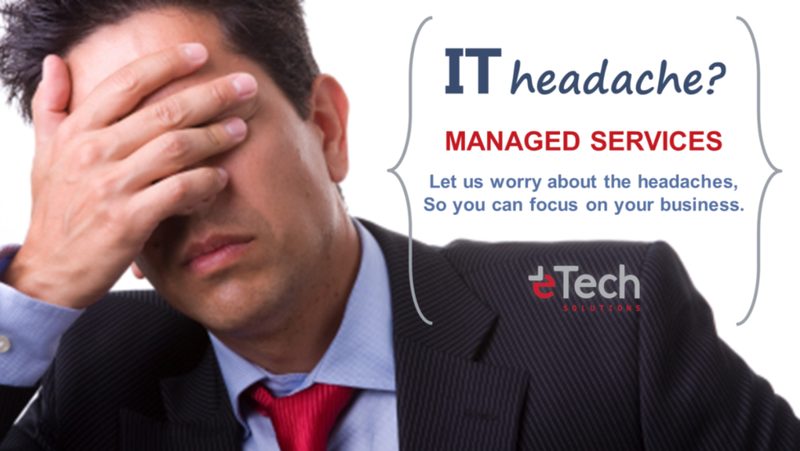 e Tech Solutions offers Managed Services as a cost-effective solution to simplify your IT while giving you peace of mind. With constant cyber attacks happening to even the largest enterprises, small and medium businesses are also victims of malicious code and ransomware attacks but the understanding of security policies and software can be overwhelming. As managed services clients, e Tech Solutions ensures clients IT systems are running at their best and are not susceptible to attacks. For more information on our security services, contact us at 866-608-4044. Can your company answer YES to these I.T. questions? WHAT DOES MANAGED SERVICES INCLUDE?